We study the mechanisms that govern the maintenance, remodeling, and specialization of nuclear organization across cell types, with a focus on the role that the nuclear lamina plays in directing nuclear organization. The eukaryotic cell nucleus is a densely packed assembly of DNA, RNA, chromatin, and other nuclear bodies, including the nucleolus. How is the nucleus organized, specialized across cell types, maintained over time, or alternatively, remodeled in response to stimuli? How does this organization affect gene expression and cell function? Our work draws from cell biology, biochemistry, and systems biology to answer these questions. The protein structures of the nuclear periphery facilitate the non-random organization of nuclear contents, in turn promoting specialization of cell function. The nuclear lamina is a protein meshwork that underlies the nuclear membrane, where it shapes and supports the nucleus. Our work focuses on the roles of the nuclear lamina in establishing and maintaining nuclear organization. 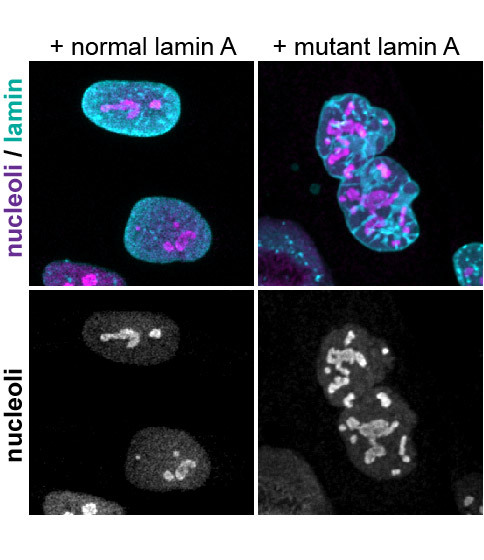 We recently found evidence that lamin A regulates the activity of the nucleolus; when cells are either depleted of normal lamin A, or forced to express a mutant form of lamin A that causes progeria, nucleoli expand and become more active. As the site of the energy-intensive process of ribosome biogenesis, nucleoli are exquisitely sensitive to inputs from signaling pathways, and their output shapes cellular metabolism. This finding suggests a novel function for the lamina that appears to be disrupted in at least one lamin-linked disease. Future work will define how the lamina regulates the nucleolus. We will also explore how nucleolar function changes with developmentally programmed changes in lamin A expression. Hutchinson-Gilford progeria syndrome (HGPS) is an accelerated aging disorder caused by a mutant form of lamin A termed progerin. We discovered that normal lamin A represses nucleoli, and that this repression is lost in progeria. This allows over-production of ribosomes and hyperactive protein synthesis, which depletes cellular energy stores. We were also able to apply what we learned from progeria to the normal aging process. 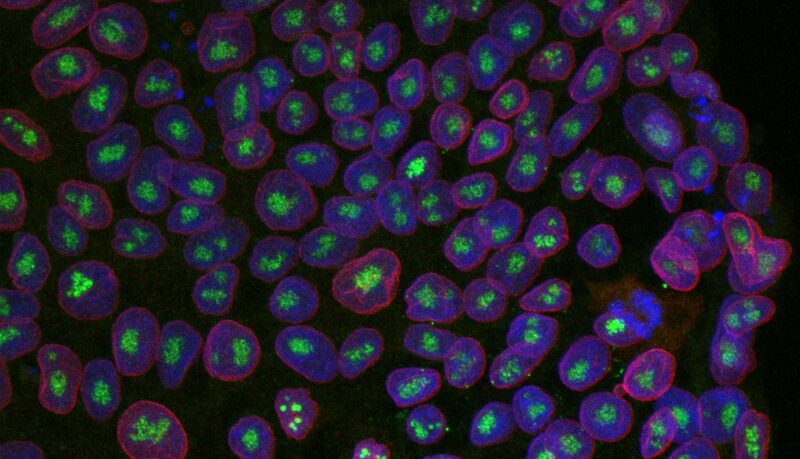 We found that within human skin cells, nucleoli expand and produce more ribosomal RNA as we age. What drives this? What are the consequences of this on cellular fitness and aging progression? Future work will address these questions. The nuclear lamina scaffolds roughly 30% of the genome and 10% of coding genes in lamin-associated domains (LADs) at the nuclear periphery. LADs are heterochromatic domains that promote cell identity by restricting gene expression. In higher eukaryotes, the nucleus is entirely disassembled each time a cell divides. However, many cells within functioning tissues have exited the cell cycle. In these cells, how long does nuclear organization endure? 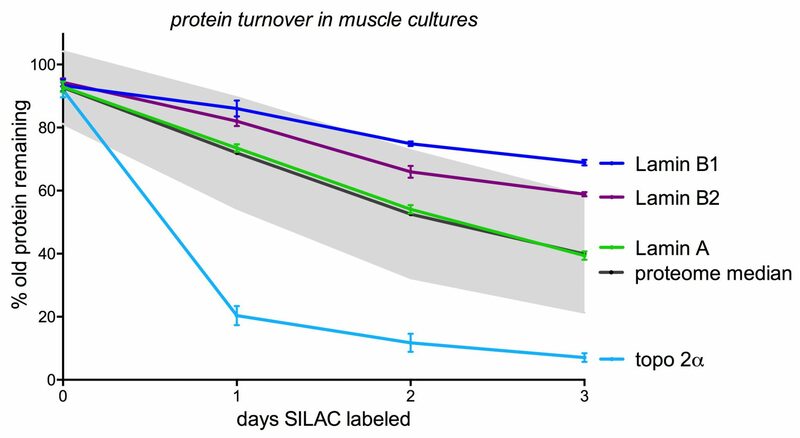 Using metabolic labeling and proteomics in muscle cells, we found that lamin A turns over at a rate similar to many nuclear proteins, while lamin B1 and Lamin B2 are extremely stable. This implies that a mechanism exists to replace lamin subunits, and that A- and B-type lamin isoforms contribute to nuclear organization on distinct timescales. Future work will define the machinery that turns over lamin A, and determine how manipulating lamin turnover affects nuclear organization and cell function in health and disease.